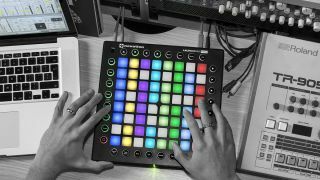 NAMM 2018: Novation is setting up a unique user experience at this year’s Winter NAMM show, with the Launchpad XL taking centre-stage. Now before you all get excited over a new product we'll have to burst your bubble; the ‘XL’ is not a new product release for the show. It is, however, an interactive experience that features 64 Launchpad Pros lined up in an 8x8 formation, all being controlled by one master Launchpad Mk2. The setup will utilise the newly-released Launchpad Arcade browser service, which allows you to instantly connect to your Launchpad without the need for a DAW. Guests will then be invited to either play with a clip-launch session or experience a life-size light show. We hope to take a closer look at the Launchpad XL at the show, so be sure to check back in a couple of weeks for some hands-on video.